New York City police are looking into an incident in which an officer deployed a stun gun on a pregnant 17-year-old in the Bronx during a chaotic scene that was caught on camera. WABC reports that officers were called to an apartment building in the Wakefield section of the Bronx on a separate issue when they were alerted to a fight involving two men elsewhere in the building. Dailene Rosario, who had the Taser used on her, said the fight was between her boyfriend and her sister’s boyfriend, who are brothers, arguing about a video game. When officers came to check on the incident, Rosario said that it had already died down, and she acknowledged that she demanded to see a warrant, apparently refusing to let a police officer into her apartment. 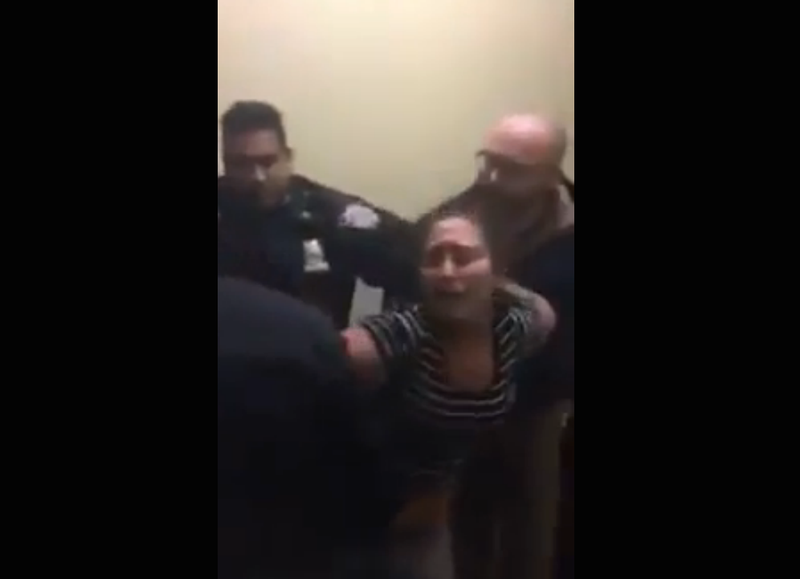 In the video, Rosario can be heard repeatedly screaming, “I’m pregnant,” while wailing for officers to get off of her. The young mother-to-be, who is about 14 weeks pregnant, says that she did not understand why the use of force was necessary, especially given that there was a sea of officers in the hallway, and she already had a handcuff on one hand when the Taser was used on her. “It was more than enough cops to handle me,” she said. According to the New York Daily News, Rosario has been to a doctor, who assured her that her baby, a girl, is doing fine. According to WABC, Rosario has already lost one child, having delivered a stillborn baby eight months prior to the incident. The Taser hit her in her right torso, leaving her with burn marks, and she is also bruised from her fall to the ground. She was charged with resisting arrest, disorderly conduct and harassment. Police accuse Rosario of pushing an officer into a door frame and flailing her arms, throwing herself to the floor and sitting on her hands, refusing to be handcuffed, when officers tried to arrest her. According to the Daily News, internal-affairs investigators interviewed witnesses about the incident Tuesday night, but so far no one has been disciplined. Read more at WABC and the New York Daily News.